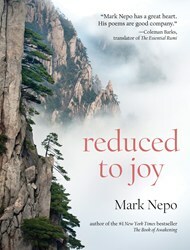 Mark Nepo's Reduced to Joy is already changing lives and becoming a bestseller. Mark Nepo is a poet. He’s an author and a philosopher and when he writes, he writes purely from the heart. Mark Nepo, the New York Times bestselling author of The Book of Awakening, has been called "one of the finest spiritual guides of our time," "a consummate storyteller" and "an eloquent spiritual teacher." Now in his sixties, he has written Reduced to Joy, a book of seventy-three poems about the nature of working with what we’re given till it wears us through to joy. Nepo says, "Poetry is the well from which all my books rise. It’s where I always go to listen, always stunned by what arrives. I bring these poems back from the deep like shells from the sea that we can look at together." Profound and accessible, Nepo’s poems are tools for staying close to what matters. Mark Nepo will be appearing on Oprah Winfrey’s program “Super Soul Sunday” for two weeks in October. Also in October, O Magazine will feature a series of excerpts and interviews with Nepo. Oprah.com will also be running features on Nepo in October. Oprah called Nepo’s previous work The Book of Awakening her ultimate favorite thing, catapulting The Book of Awakening to a #1 New York Times bestseller. On Amazon.com, Reduced to Joy reached #1 its category on the first day it was available for pre-order, and has remained in the top ten. It is still #1 is Hot New Releases. The Intent Blog said of Reduced to Joy, "Mark’s writings possess the power to immediately move us into connection with a subtle and powerful awareness at the deepest, most soulful level." Beliefnet also recently interviewed Mark Nepo about the genesis of this book of poems. He shared an excerpt from the book, his poem "Where is God?"